The border between Pennsylvania and Maryland is set at 39°43′ North latitude. 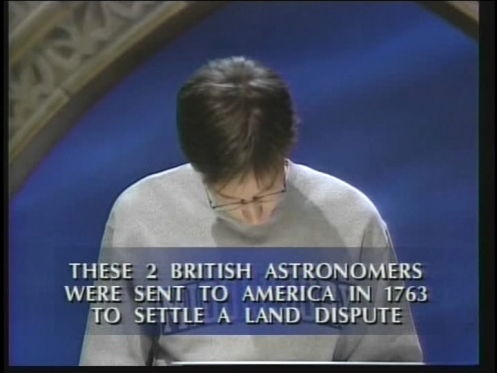 This strange number was determined by two astronomers from England, Charles Mason and Jeremiah Dixon, in 1767, following a century-old dispute that occasionally turned ugly. 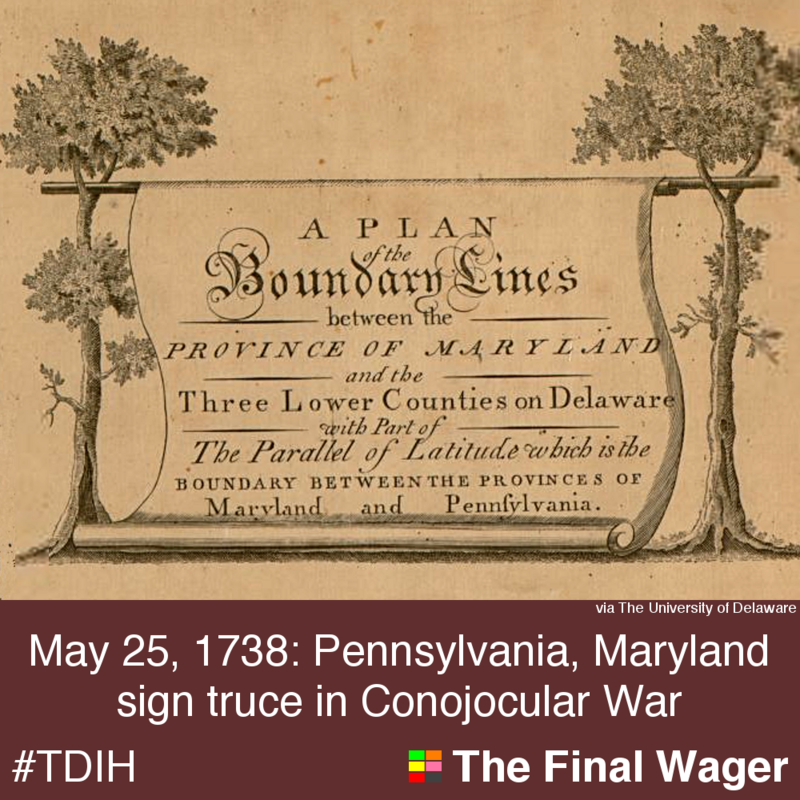 On this day in 1738, Pennsylvania and Maryland declared a cease-fire in the fight over their boundary – and of the revenues they could derive from taxes. Known as the Conojocular War (after the Conojohela Valley, where the dispute was centered) or Cresap’s War (after Thomas Cresap, the Maryland ringleader of hostilities), the fight was the result of a poorly drawn map and some geographic misunderstanding. Pennsylvania’s charter specified 40° North latitude as the border with Maryland. Both King Charles II and William Penn believed that line was close to New Castle, Delaware (also part of Pennsylvania) when it was actually north of Philadelphia. Whoops! Thomas Cresap, a proud Marylander, knew he couldn’t win a fight claiming land near Philadelphia, so he instead went west of the Susquehanna River, opening up a ferry service and receiving a grant of 500 acres from his home colony. In response to the debate, Pennsylvania proposed 39°36′ N as a compromise, creating a 28-mile-wide swath of disputed territory. Cresap was fierce in defending what he viewed as his property, often resorting to violence. As Pennsylvania authorities issued warrants for his arrest, Maryland’s governor promoted him in the province’s militia. King George II intervened, putting it to an end in 1738; nearly three decades later, Messrs. Mason and Dixon were given authority to mark the border as they believed it had originally been intended. Fun fact: the northern border of Delaware is supposed to be a circle with radius 12 miles from the cupola of the courthouse in New Castle. For more on the border issue, visit this site at The University of Delaware, also the source of the main image. Delaware was never unarguably part of Pennsylvania, though there was a faction that said so, and the two colonies had joint governors three times and a joint Parliament and governor once. The dispute continued after independence, which is why Delaware rushed to be first to ratify the Constitution. It settles that question. Interesting! Thanks for that bit of history, jdgalt.